Since my first day here, I have been keen on blending in and not looking obvious that I don't live here. No matter how hard I tried, I was always being caught by the taxi and bajaj drivers. The reason why I was so eager to blend in is because I'm not good at negotiating prices. I never want to negotiate a price so low that it undermines someone's hard work yet I don't want to pay more than an average person would. When you look foreign, as in non-Tanzanian period, some or should I say most jack up their prices from the assumption that foreigners have excess money because it's obvious they're here for touring purposes or on business. Why else, right? My Swahili still needs work, I can't hold a conversation long without speaking Swanglish, which is a dead give-away amongst locals. Not only that, but my pronunciation is a bit different even when I am speaking Swahili. I decided to come up with, what I thought, this brilliant idea and tell them I'm Tanzanian but I go to boarding school in Malawi or Mozambique (I still look young enough ;) ) as an excuse to why my Swahili is not up to par. That worked for a little bit but unfortunately didn't last. I found this young cab driver that always charges me fair prices so I decided to add him to my list of drivers, incase all of them are unavailable for some reason!?! My young cab driver's name is Abbas and one day as I was approaching his cab, I heard two men debating whether or not I was Tanzanian. They spoke in Swahili and it was so funny listening as they were completely clueless that I was aware of their conversation. I regret not asking them why they were having that debate. I asked Abbas what was it about me that made people question where I'm from? Clearly those men didn't hear me speak so they judged based on what they saw. Is it the way I'm dressed? jewelry? make-up? I knew deep down that couldn't be the reason why because I see women dressed fashionably all the time. It's not like I'm walking around dressed in Gucci glasses and carrying Chanel bags. The most expensive item I have with me is a coach bag!! Abbas let's me finish my rant before he chuckles and tells me why. "Tanzanian women walk like they have no deadline to meet. They take their time, they look around and enter in and out of shops even if they walk that same path everyday. You on the other hand walk like a foreigner/westerner. You walk like you have no time to waste and aren't even moved/startled by a honk or by a hello, half the time, you're so focused you don't even hear someone speak to you unless you directly look at them. As a cab driver sitting and waiting for a customer, or even if I'm just watching you approaching my post...I see the way you walk. You walk fast, too fast to be a local and so I have my fixed price before we even exchange our first greeting." I've taken a long break from my last post! I met a friend, Maggie, whom I'll introduce in a later post. She and I have been busy exploring Dar Es Salaam together and hanging out. Today I'm inspired to write about my newest/current focus. I have wanted to do a detox for a while now to clear out and rejuvenate my skin as well as clean out my system, but seems like I could never get around to it. I found myself easily distracted by an array of tasty dishes which made me put this off further more. Ramadhan starts tomorrow and although I am Christian, I thought about participating for my own personal spiritual cleanse. I went to the market today to buy some fruits and veggies for breakfast and to my surprise, the prices were much lower than they normally are. I didn't ask and just chose to enjoy the save. Later on, I finally asked a family member who escorted me, why the grocery was much cheaper today. Is it because it's Monday? I had no clue! He tells me it's because of Ramadhan. I gave him a puzzled look...before it registered what he meant. People will be fasting, hence, less food will be bought. Ah! I think I will MOST certainly participate in Ramadhan this year but instead of fasting, I will be feasting with an abundance of fruits and vegetables :) :) Now I get to detox, save money, and spiritually cleanse....feels like a win to me. Another thing I'd love to mention that makes me enjoy Tanzania and slightly not miss the U.S. is the organic vs. non-organic food/prices. I don't have to worry about that when it comes to buying fruits here, they're all fresh and organic without the ridiculous organic prices! If you have the means and are interested, I encourage you to join me. Not sure how long I will be going with this so I've decided to go on a weekly basis....let's just hope I survive week 1! 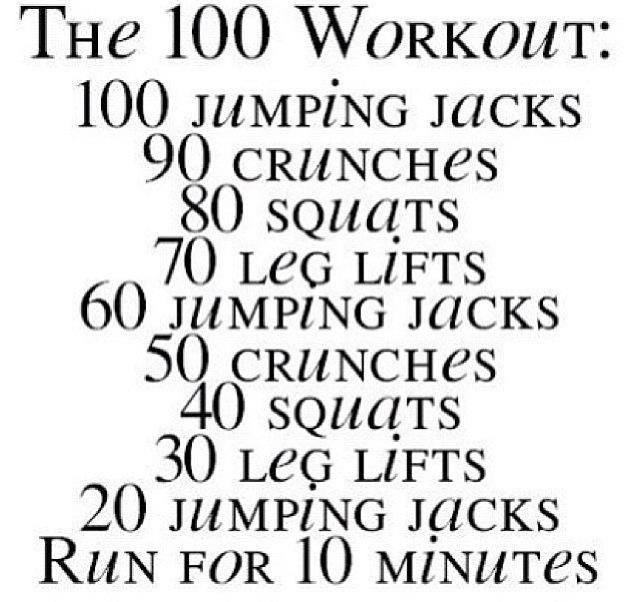 The workout routine I'll be doing!